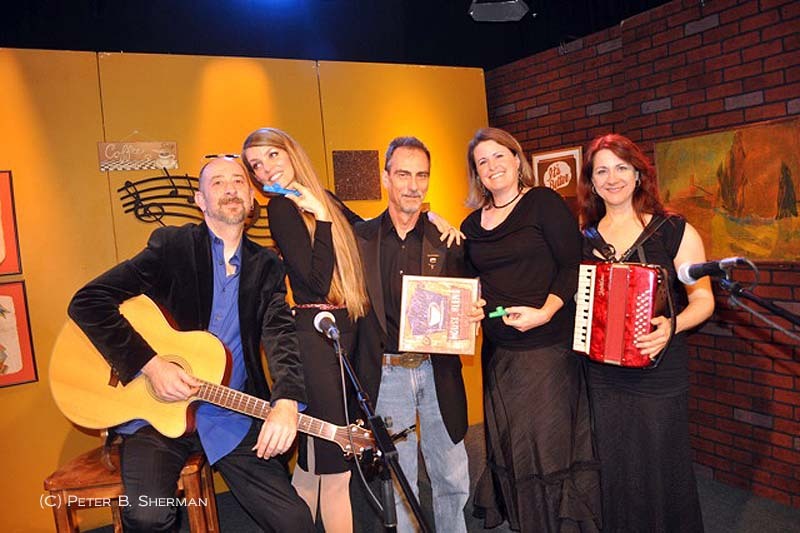 Christian Nesmith, Circe Link, Stephen K. Peeples, Laura Drew and Debra Tala on the 'House Blend' set at SCVTV. Photo: (c) Peter B. Sherman. Circle Link (center) and Christian Nesmith (left) on SCVTV’s House Blend hosted by Stephen K. Peeples, with Laura Drew (right) and Debra Tala (far right). Photo: (c) Stephen K. Peeples. Genre-bending singer, songwriter, guitarist, bandleader and indie recording artist Circe Link with guitarist/songwriter/producer Christian Nesmith take center stage on the next all-new edition of “House Blend,” the WAVE award-nominated music-and-interview program on SCVTV hosted by veteran music journalist Stephen K. Peeples, debuting on Saturday, Jan. 19, 2013, at 10 p.m. Pacific Time. With Nesmith on acoustic guitar and backing vocalists Debra Tala (aka “The Brunette”) and Laura Drew (aka “The Blonde”), the tall, willowy Link performs exclusive unplugged versions of three harmonious new songs from her forthcoming and as-yet-untitled eighth solo album, produced by Nesmith and set for release this spring. “Gettin’ Old,” “City Lights” and “Gossip Queen” make their worldwide TV debut in this “House Blend” episode, which also includes the classic video for “One Drop of Poison,” the title track of her 2007 album. Based in Los Angeles and enjoying an international cult following, Link and Nesmith also talk with Peeples for a few minutes between songs about the duo’s individual and collective back-stories, including how they met and began making music together (professionally and personally) a decade ago, how her original song ideas come from the “cosmic radio” station in her head, and how she came to have such a vociferous following in Japan. Christian Nesmith, Circe Link, Stephen K. Peeples. Photo: (c) Peter B. Sherman. For more info, check out Circe Link’s and Christian Nesmith’s pages on Facebook. Extra: Check out the post-taping interview not included in the final show! “House Blend” is hosted and written by Peeples, who co-produces the series at the SCVTV Media Center in Newhall, Calif., with SCVTV studio director Megan Perez. She also directs the show, assisted by SCVTV’s Austin Dave. Leon Worden, SCVTV president/CEO, is the series’ executive producer. “House Blend” premiered on SCVTV in September 2010 and airs Saturdays at 10 p.m. Pacific Time, with an encore Thursdays at the same time. The series is seen on Time Warner Cable Channel 20 in the Santa Clarita Valley, and AT&T U-Verse Channel 99 throughout Los Angeles and Orange counties. In addition, all “House Blend” shows produced to date — nearly 30 original editions with music and interviews and a dozen all-music best-of compilations — are archived and viewable on demand; click here.